If you’re looking for ways to make your RV listing more incentivizing to renters, you’re in the right place. Keep reading for our research-based Outdoorsy advice and insight. 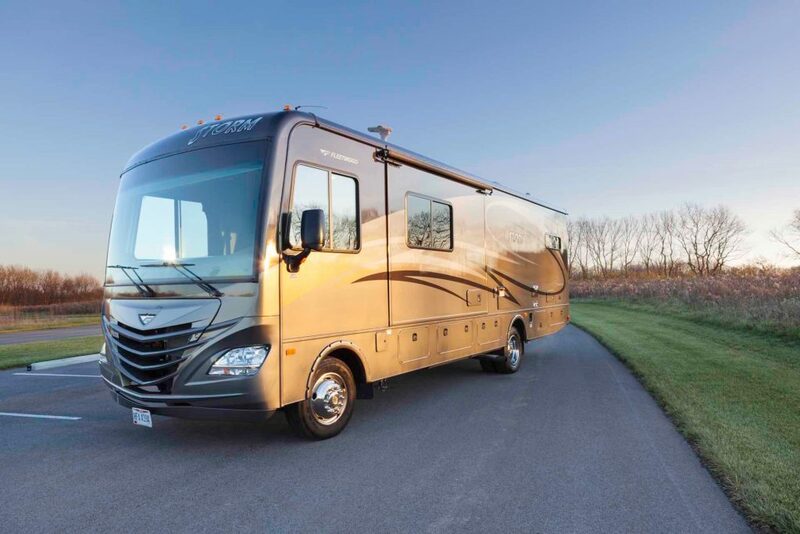 It sounds simple enough—just take great photos of your RV, right? 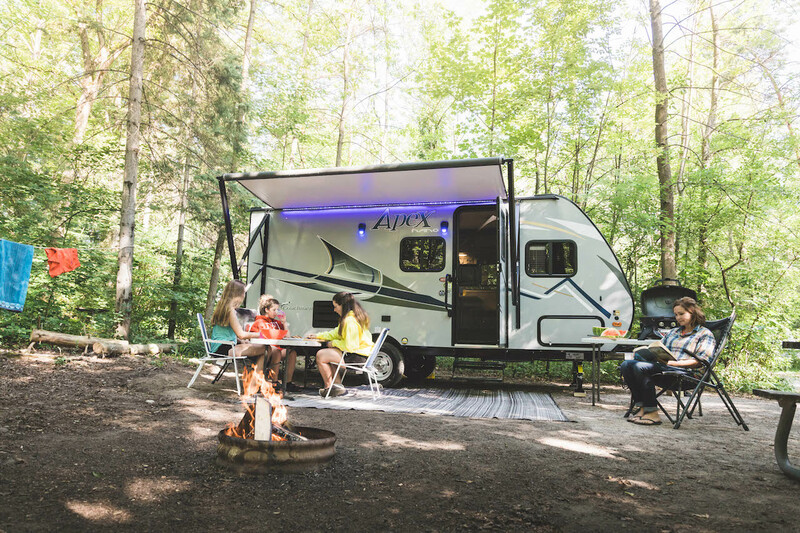 After all, your pictures are the very first thing a customer will see when considering your rental, and they could easily make or break their decision to book your RV or travel trailer. Generally speaking, listings that include great images catch more eyes, receive more interest, and end up with more bookings. But what factors make a photo “great”? Here are the most important photo tips for making your space and your listing look better than ever. The rig should be clean, both inside and out. 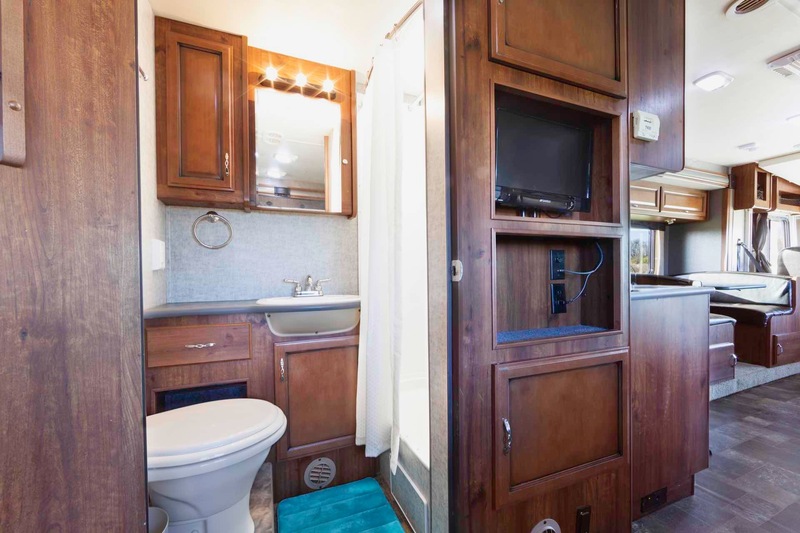 Mop and vacuum, wipe down all surfaces, and stage the RV as you would a home for an open house. This means there should be no odd items—such as cleaning supplies or toiletries—sitting out, towels should be put away, and beds should be made. As far as the exterior goes, windows should be clean and clear and no road dirt or layer of debris should be seen on the outside of the vehicle. Cracked or missing vent covers, light covers, and seals should be replaced before the photoshoot. Because the very first image your customers see will likely be the exterior of your RV, you want your outside photo to be a great one. To accomplish this, consider where you’re parked. Everything seen in the background of your photos reflects on you and your rig, so you will want a clean and clutter-free environment. Utilize the amazing outdoor places you live near—the places people love to visit. Waterfronts, parks, forests, deserts, etc. Avoid driveways, parking lots, and storage units, as we doubt your renter will want to spend their vacation in a concrete jungle. Outdoorsy research found that an RV listing with a scenic backdrop in photos had a 40% higher chance of being booked by a renter than one with a backdrop of a garage or driveway. When it comes to photography, good lighting is incredibly important. Whether you’re shooting your RV or a family photo, getting the light right is the difference between a decent photo and an amazing photo. When you’re taking pictures of the interior, open all your windows and let some sunlight fill the spaces inside your rig. This will make the RV easier to photograph, making it feel bigger, brighter, and more appealing. When you shoot the exterior, make sure the sun is behind your camera. This will help ensure you don’t get a silhouette effect. The best light, whether you’re shooting interiors or exteriors, can be found during what pros call the “golden hour.” The golden hour is the time right before the sun fully rises, or the time right before it fully sets. The light is softer, lower to the ground, and a beautiful gold color. 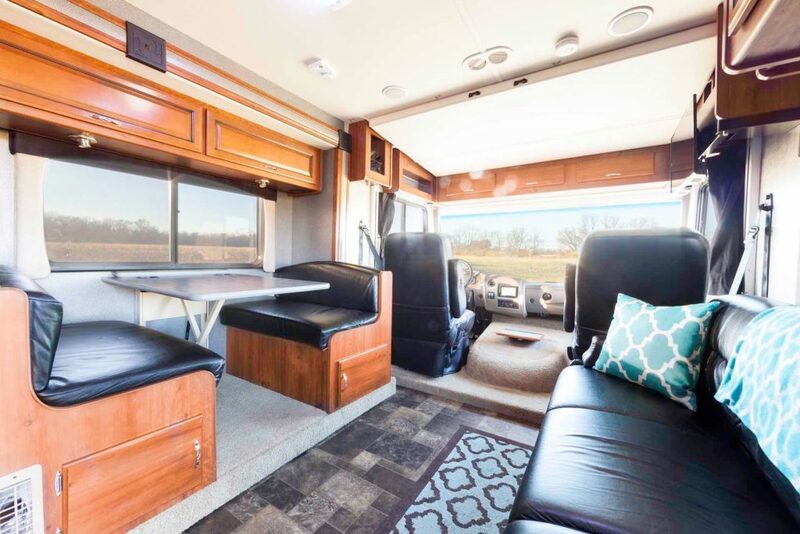 Outdoorsy research found that an RV listing with good lighting in photos had a 29% higher chance of being booked by a renter than one without. When your images appear on your profile, they will show up in landscape—or sideways—orientation. Therefore, it’s best to take landscape photos rather than vertical shots. As a bonus, photos shot in landscape mode will not only look better on your listing, they will also make the rig appear larger. Resolution (the quality level of images your camera can take) matters. The higher quality the camera, the more likely you are to capture a great image. Even when lighting, environment, and posing are all great, a photo shot with a great DSLR-style camera can turn out much better than a quick shot with a camera phone. If you have access to a higher-end camera, experiment with using it for your photos. You will almost immediately see sharper, cleaner photos as an end product. Outdoorsy research found that an RV listing with high resolution in photos had a 47% higher chance of being booked by a renter than one without. Shooting straight into a wall makes a space feel tight and flat. Try shooting into a corner instead to give the image more depth and make the space feel more open.The same effect can be accomplished by shooting down the middle of a long hallway rather than straight into a wall. When shooting little kitchens, tiny bathrooms, and other small spaces, you may feel like you need to point the camera down for an “overhead shot” in order to get everything in the frame. Unfortunately, this makes the space feel even smaller than it is. Instead, kneel or bend your knees a little bit and get a shot that looks more “into” the space. Remember that, when taking photos for your RV listing, it’s best to give a potential renter an enticing sense of the space. 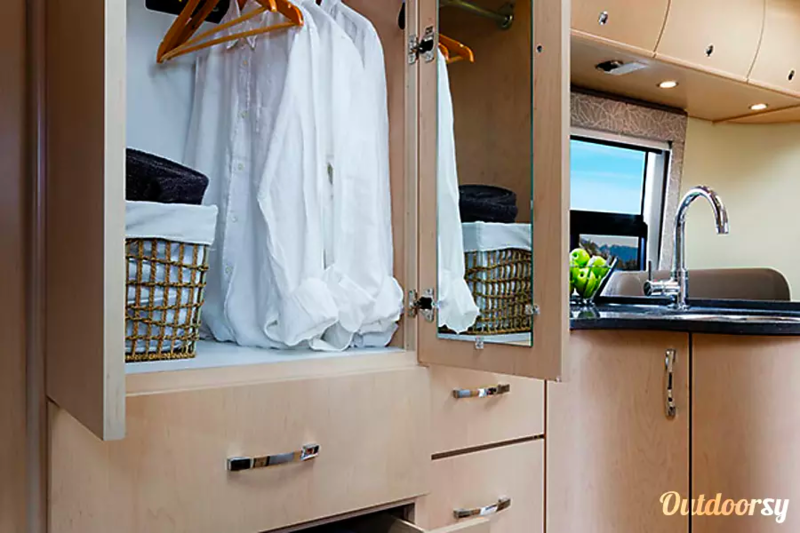 Rather than taking a truly documented photo of every single feature in your RV—which could make the space feel crowded or small—try to focus on the main highlights you want to feature. 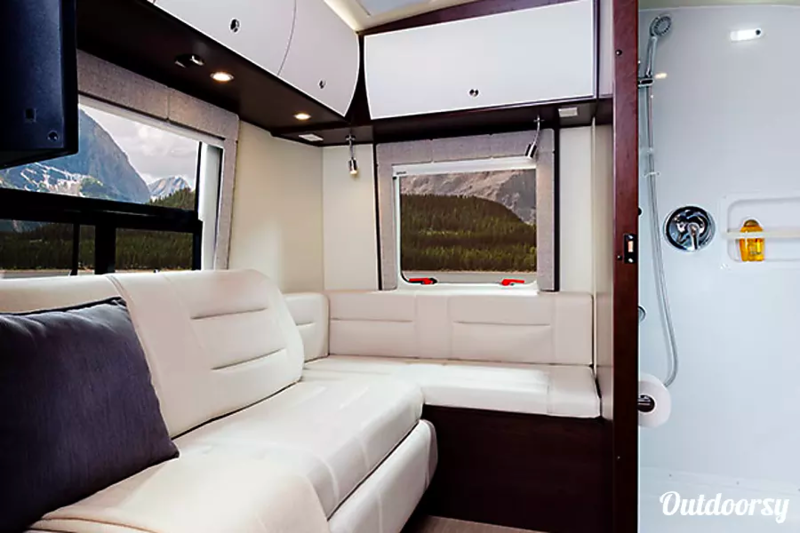 You want potential renters to be able to imagine themselves experiencing your RV and that means seeing other people mixed into a few of the shots—especially exterior shots. That said, there are a few fine lines to follow when including people in your photos. No. 1: Remember that your RV is still the focal point of the shots. Less is more when it comes to including people in your photos. No. 2: People, whether it’s you or your friends and family, should be kept in the periphery of the shot. Don’t place people in the center of the photo or have them look directly at the camera. Instead, keep people off to the side of the RV, engaged in an activity as though they are unaware that a photo is being taken. No. 3: The more photogenic the people in the photos are, the better. 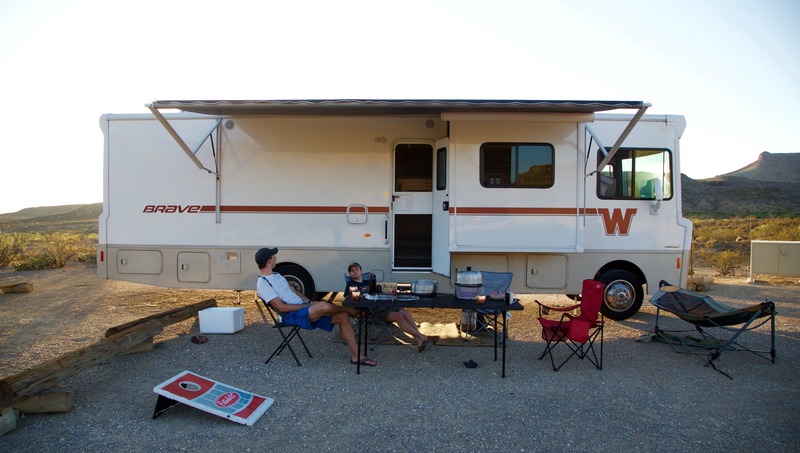 Consider your target demographic for an RV rental is everyone from young couples to families to retirees. Keep the people in your photos looking classy and relatable to every potential renter by enacting a dress code. You want the people in your photos to look comfortable, but not too comfortable. No sunglasses or hats blocking a person’s face and no distracting clothing like dresses, costumes, goofy T-shirts or revealing swimsuits. Above all else, remember that a smile is worth a thousand words. For starters, try recruiting a few participants to stage a camping scene in front of the RV (i.e. playing a game of chess, grilling on a portable grill, reading a book, or relaxing around a fire pit). Open up the awning if you have one. In general, think of adding in people to your photos like adding sprinkles to a cupcake. The sprinkles make the cupcake more colorful, but if you took them away, you’d still have a tasty cupcake. Outdoorsy research found that an RV listing with people in photos had a 58% higher chance of being booked by a renter than one without. Earlier in this post, we talked about cleaning up all the clutter and removing personal items from the space you are shooting. Once that has been accomplished, it’s okay to use a few “props”—emphasis on a few—to liven up the space a bit. Remember though: less is more. It’s a fine balance to strike. 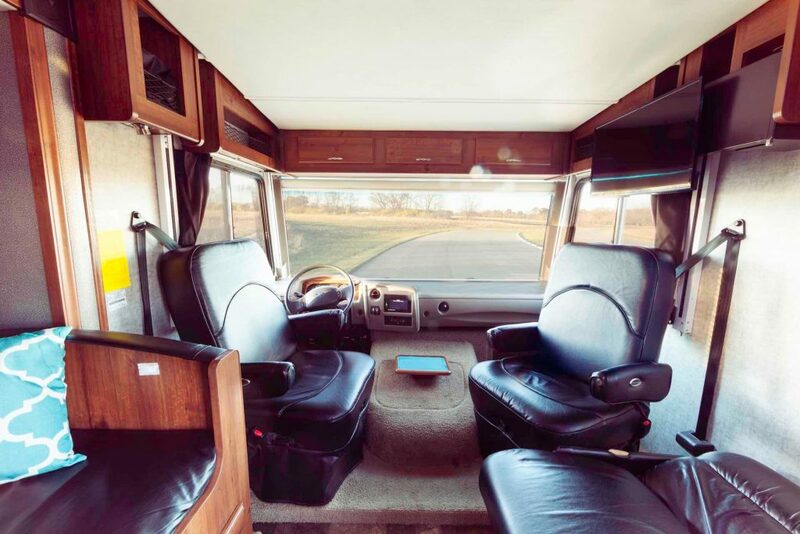 You don’t want your RV to look cluttered, but you do want it to look inviting. Consider a magazine ad that attracts your eye—most likely it’s one that has a lot of “white space” and not one of the many that’s cluttered with images and text. Moral of the story: Simplicity is best. Our eyes have the same visual expectations inside an RV too. Our brain feels happy when the horizontal line inside the RV—like a table, a dashboard, or a cabinet—are level. 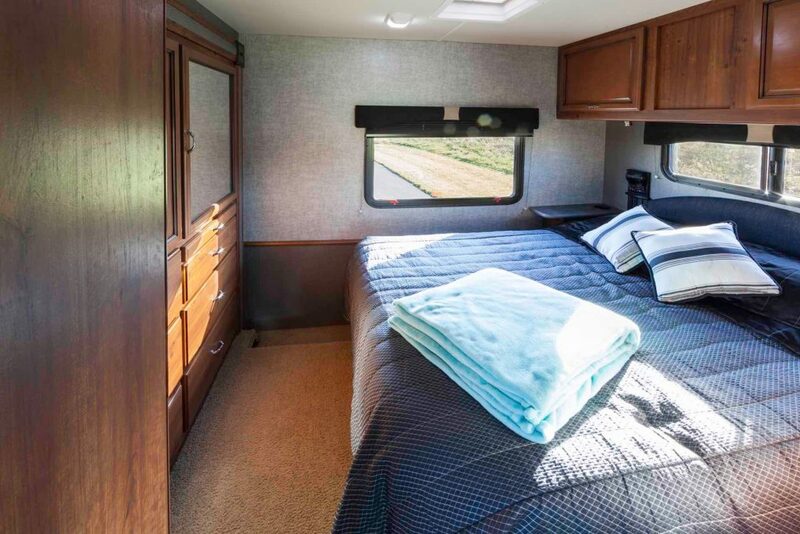 Always double check that you align your eye level to be parallel with the floor and ceiling of the RV, thereby making sure the horizon line is straight when shooting the interior of your RV. If the horizon line is slanted, it makes the viewer feel as though they are falling or off balance—two things a renter certainly doesn’t want to feel while camping. Vertical lines are equally tricky. If you will be shooting verticals lines—such as two walls opposite each other, cabinets, or a doorway—do your best to make them as parallel as possible. If shooting two walls, find the line that separates the adjoining spaces and make sure that line stays vertical when lining up the shot. If you decide to take a photo of the cabinets, consider the base of the cabinets a line you want to keep parallel to the floor. You may not always be able to accomplish this perfectly, but with a bit of effort, you should be able to frame the shot so walls, cabinets and doorways aren’t bending away from or toward each other. Try several angles or camera positions to see which one looks best on the computer, then select your favorite to upload. Encourage renters to feel connected to your RV through your photos by organizing the album in a way that tells a story. Here are 5 photos you don’t want to forget when listing your RV. We know you are the perfect host and take special care to make every renters experience optimal. Include photos of all the personalized add-ons and amenities that separate you from the rest. For example, if you offer plush towels, position them nicely on the edge of the bathroom countertop. Try placing a nice throw blanket on the couch to give some texture, color, and comfort. Tiny potted succulents or cacti would also work very well on small RV shelves or on small RV kitchen counters—after all, RVing is often about nature, so why not bring a little nature into your RV listing photos with some plant props? The renter is inevitably going to spend ample time on the road and in the driver’s seat. Show them their throne through inviting images of the seats, console, and dashboard. Again, as this is tighter space, we recommend using the “into, not onto” rule, and watch out for glare from the sun coming through the windshield. 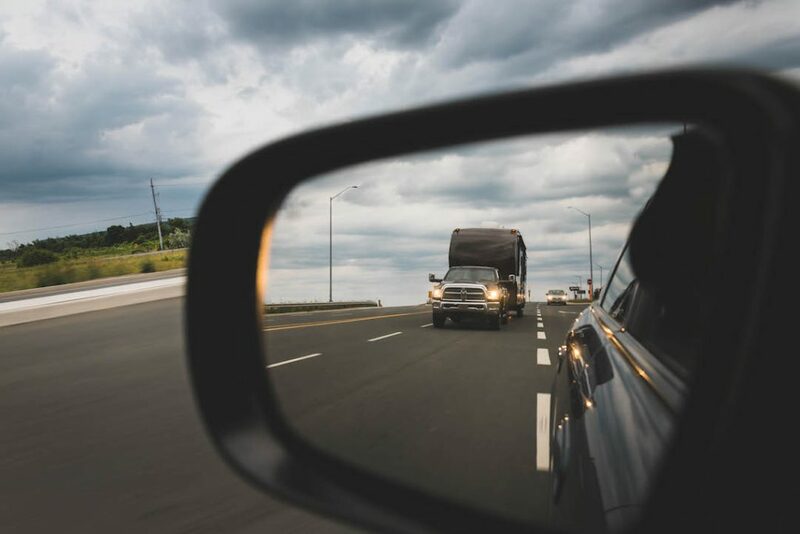 If possible, make sure the view out the windshield is a scenic one (think: a green pasture or park view instead of your driveway)—this will further enhance the appeal of the driver’s seat shot. There is nothing more important than a good night’s sleep. 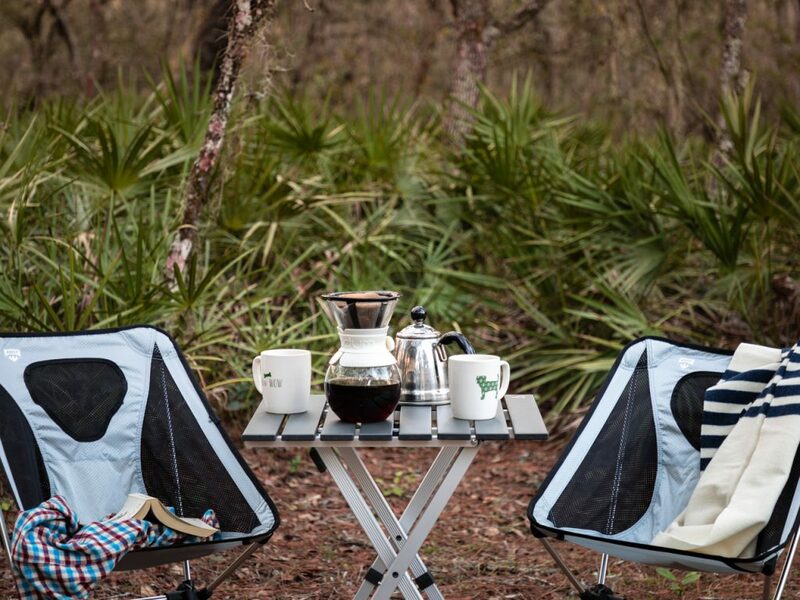 If renters wanted to sleep on a rock, then they would pitch a tent. A good night’s sleep is a luxury that the renter has decided they can afford. Your photos should show renters where they will be sleeping by including a nice photo (or two) of the bedroom. Be sure any included bedding is on the bed when the photo is taken, and if the bed requires assembly, snap a shot of before and after you’ve set it up. For a traveler, the place they share food is the place they will rejuvenate and connect with others. Therefore, a photo of this space is something many renters look for when shopping for a rig. Grab this photo from one corner of the table while also kneeling down to get the best angle. If your table is removable or collapsible, set it up for the photo and include the setup process in the description. 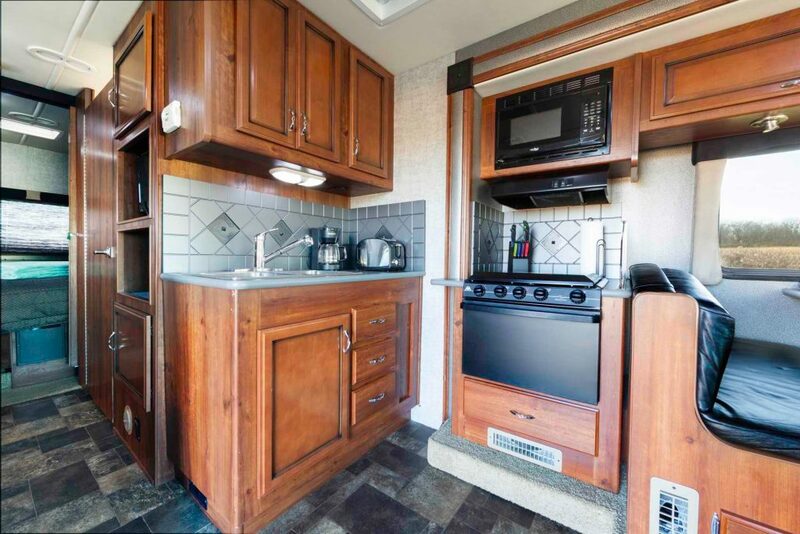 Snap photos of areas where renters spend most of their waking hours inside your RV, namely the kitchen and bathroom. 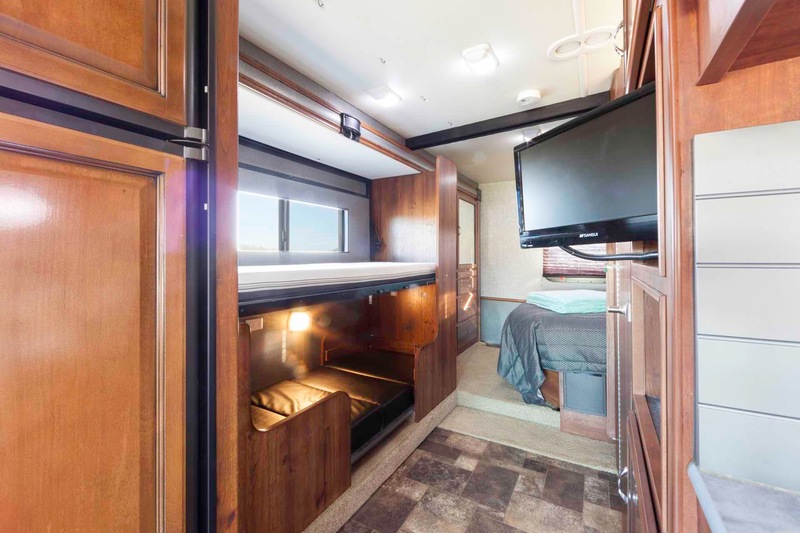 These shots give the renter an idea of how they will function inside the space, and how comfortable they will be once they’re on the road. Although these two spaces can vary in size based on the type of rig, let’s be honest, they will never be as large as a mansion. Because of the smaller size, these shots can be difficult to get right. We recommend using the aforementioned “into, not onto” rule. 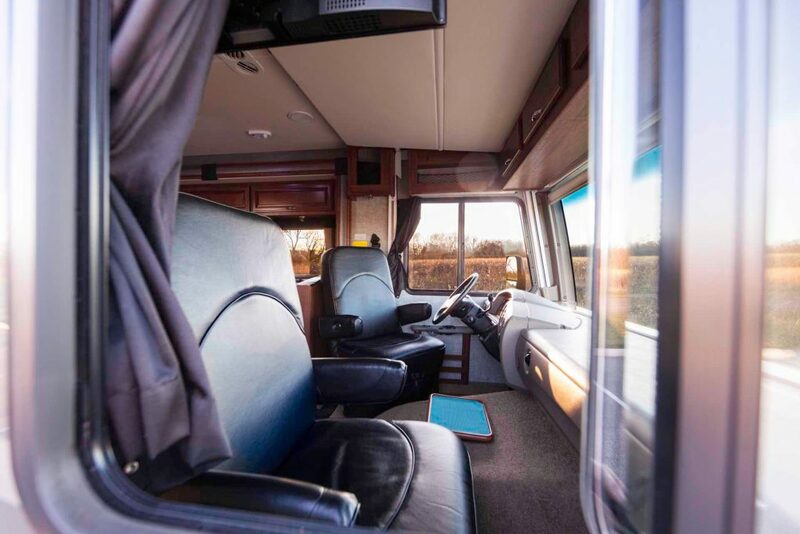 Here’s the truth: potential Outdoorsy renters are looking to experience your rig before they press “Request Booking.” Providing them with a full tour of your rig through compelling imagery will help them envision themselves in the driver’s seat—and on the road.